Travelers who choose the hop-on-hop-off travel option are judged unfairly. 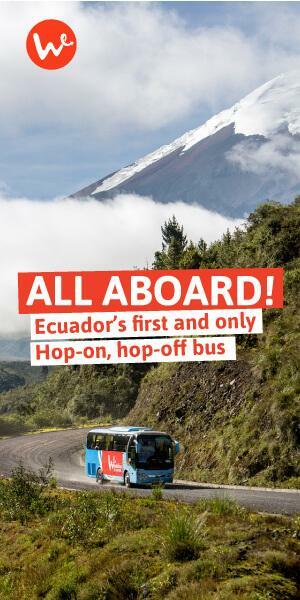 The assumption is that anyone that does hop-on-hop off in Ecuador isn’t a real traveler. They don’t get down and dirty (aka lost and robbed) like you’re supposed to. They’re only interested in the popular, touristy sights, rather than getting to know the country and culture. Despite the fact that you’re reading this blog on the Wanderbus website where we’re trying to convince you to use our services, there are a number of valid reasons for choosing a hop-on-hop-off service in Ecuador. In the following blog you’ll learn why hop-on-hop-off in Ecuador is actually the best way to travel around the country and how Wanderbus is filling a much needed gap when it comes to getting around in Ecuador. Who rides hop-on-hop-off in Ecuador? Do you fit the profile? There’s one thing all our clients have in common: they’re strategic. People who choose a hop-on-hop-off service like Wanderbus in Ecuador have weighed the pros and cons of using public transportation vs. a private tour company vs. a service like Wanderbus, and reached the conclusion that Wanderbus is the most affordable, comfortable and fun way to travel around Ecuador. In terms of our clientele demographics, we tend to attract backpacker types of all ages who are willing to spend a little more for the sake of comfort and convenience, as well as solo travelers, many of whom are female solo travelers, who want a chance to make new friends along the road, and benefit from the safety that comes with group travel. If you’ve read through any Ecuador-related forums on Tripadvisor there are two general takeaways: 1) public transportation is ridiculously cheap in Ecuador and 2) the chances of getting robbed while using public transportation are quite high. In fact, you can count on something, at some point, getting stolen from your luggage if you’re using public transportation. On the spectrum of cheap to expensive, public transportation sits at the cheap end, whereas private tour companies sit on the expensive end. Sure, on a private tour, you won’t have to worry about your possessions getting stolen, but you pretty much won’t have to do anything at all. The entire tour is laid out for you, from pick-up times to meals to hotel arrangements. It’s convenient, but doesn’t leave much room to modify your schedule and interact with Ecuadorians. Right in the middle of the spectrum, sits Wanderbus. Wanderbus, the only hop-on-hop-off service in Ecuador, is really the perfect compromise between public transportation and private tour operators when it comes to getting around Ecuador. Ecuador is a safe place to travel, BUT you should take certain precautions when planning your trip so that your vacation isn’t ruined by one of your prized possessions getting stolen or, god-forbid, having to experience some kind of assault. Are you a female solo traveler worried about safety in Ecuador? Like any country in the world, you must err on the side of caution and shouldn’t assume that safety precautions mean the same thing across cultures. In Ecuador, a basic safety precaution is: don’t carry around valuable items and watch your possessions at all times. Easy enough, but the reality is that as a tourist, you’re probably going to have a smartphone, a decent camera, your Kindle, not to mention your credit card! It’s impossible to keep an eye on your things at all times, especially in public spaces and on public transport. By traveling the country by bus, you will definitely be saving a dime, but if your fancy phone or camera gets “lost” in the process, is it worth it? Wouldn’t you rather travel worry-free for a little more money? In terms of safety, Wanderbus wins the prize. The only other people riding the Wanderbus are like-minded travelers with the same security concerns you might have. We don’t pick up passengers at any point, on any route. Additionally, in terms of road-safety, our buses are modern and regularly maintained, as opposed to local Ecuadorian buses that frequently break down, or worse, are involved in road accidents. And finally, our drivers are extremely professional and take our clients’ safety very seriously. What about personal safety? Each one of our buses is supervised by a professional, bilingual guide who will provide explanations about the sights, recommendations on where to stay and what to do in each destination, and solutions for any problem that may arise among our travelers. Wanderbus provides a safe environment for solo travelers who may be the target of theft or for female solo travelers who often face verbal (and other types of) harassment during their travels. While you can’t avoid this completely, traveling on the Wanderbus is often a respite from these constant threats that are, unfortunately, a common and real part of traveling in South America. One reason travelers skip a hop-on-hop-off services like Wanderbus is because they assume they’ll have to stick to a set itinerary once they’ve purchased their passes. Wanderbus provides you with various pass options that can be used as a starting point or “skeleton” when planning your trip – it’s up to you to build out the body. The passes are designed to stop at the best destinations across Ecuador that will likely already be in your travel plans, such as Quilotoa crater, Cotopaxi volcano, Baños, and more. Our point is that your trip with Wanderbus is COMPLETELY customizable. For any changes you make, our english-speaking customer service representatives will help you figure out new itineraries, as well as pick up and drop off points. Ecuador is a spectacular country to discover, and while you’re traveling through here, you’re sure to come across a place (or perhaps a person… ❤) that deserves more of your time and attention. With Wanderbus, you can decide to stay for several more days (or more) at a destination on the same pass. In fact, we highly encouraged you to do so, so that you make the most of your pass and customize your personal journey. One of the top benefits to traveling with a hop-on-hop-off solution like Wanderbus is convenience. Rather than traveling to a bus terminal on the outskirts of town, Wanderbus picks you up and drops you off at convenient, central locations close to the hostels and hotels where most travelers stay in every destination. This saves you that extra trip to the bus terminal which, in Quito, can cost you more than the bus fare to your destination! With Wanderbus, you’re skipping the bus terminal and the process of carefully selecting from a number of bus companies, each with their own policies, prices and comfort levels. Additionally, there are currently ZERO bus companies in Ecuador that allow you to purchase your ticket online. Instead, you usually have to go to the bus terminal in person a few hours before departing and wait around until your bus leaves. During holiday periods in Ecuador, this is no joke. With Wanderbus, you can book online with just one click. Everyone knows that one of the best ways to forge real friendship is by traveling together. Many people that choose Wanderbus do so because it’s an easy way to make new friends. If you don’t strike up a conversation with another Wanderbus traveler while waiting at the pick-up location, you’ll have a chance to talk on the bus, or once you arrive at the destination. By midday, you’ll probably be having lunch with your new Wanderbus acquaintances and discussing your travel plans for the next destination. And by the end of the day, you’ll surely connect with at least one other traveler and start planning a hike together during the next leg of your trip. If you’re a traveler that prefers to fly solo, that’s fine too. You can always keep to yourself and just enjoy the comfort, safety and convenience of using Wanderbus to get around Ecuador. Traveling with Wanderbus is simple and, again, flexible. To start, check out our various passes to determine how they match with your existing plans. Take into account whether you’re flying into Quito or Guayaquil (or arriving there by bus from Colombia or Peru), how much time you have available, and which destinations you can’t miss during your trip. If you’d like more guidance before purchasing your pass, read our Planning Guide here. If you have any questions about our destinations or schedules, chat with us. Use the chat box in the bottom right hand corner of this window to connect with a sales representative. Buy your pass with just one click and reserve your start date so we know when to expect you! Remember, you can always change your dates to fit your itinerary if you decide you want to stay longer at a destination. Once you’ve reserved your spot, you’re good to go! We’ll be waiting for you at the designated pick up point and ready to provide as much (or as little) information you need to make the most of your trip. And, at any point along the way, you’re invited to HOP ON and HOP OFF the Wanderbus! When you’re planning a trip to a foreign country, what do you picture? Is it the adventure of ziplining through the cloud forest? Or watching as a male humpback whale spectacularly launches his 50-ton body through the air? Or is it at a crowded bus terminal where nothing makes sense and life has lost all meaning? 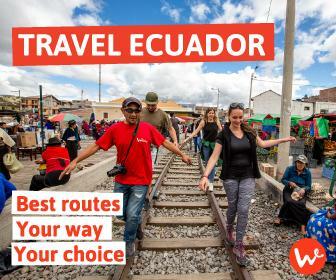 Wanderbus, the only hop on, hop off travel option in Ecuador takes the stress out of planning your travels, while still providing the adventure you’re seeking. What are you waiting for? Check out and book a pass today.